The Volkswagen brand is moving forward with its electric offensive and gradually creating the production capacity needed for building more than one million electric cars per year throughout the world from 2025. The Group’s largest and highest-performance electric car plant is currently being created in Zwickau, Germany. In the future, up to 330,000 electric models per year are to roll off the production line there, more than at any other plant of the Volkswagen Group. As the first high-volume automaker in the world, Volkswagen is, therefore, converting an entire plant from the internal combustion engine to e-mobility. Currently, the Golf and Golf Estate are produced at Zwickau. At the end of 2019, in slightly more than a year, the production of the ID.1), Volkswagen’s first electric model based on the new modular electric toolkit (MEB), is due to start at Zwickau. In the final stage of development, six electric models of three Group brands are to be produced at the plant from 2021 onwards. “The start of production of the ID.1) in a good 12 months’ time will herald a new era for Volkswagen – comparable with the first Beetle or the first Golf,” says Thomas Ulbrich, Volkswagen brand board member responsible for E-Mobility. “We intend to take e-mobility out of its niche and to make the electric car affordable for millions of people. Efficient, modern production facilities will be the key. This is why we are bundling electric car production across the Group’s brands at Zwickau . In one year, this plant will become the starting point for our global electric offensive. As the first MEB plant in the Volkswagen Group, Zwickau will, therefore, play a pioneering role in this future-oriented technology. All the electric cars to be built at Zwickau in the future will be based on the modular electric toolkit. This was developed especially for full-electric cars and makes full use of the possibilities of e-mobility. For example, MEB vehicles offer longer ranges, more space and a variety of new digital services. By 2025 at the latest, the brand plans to sell a total of more than 1 million electric cars per year and to be the world market leader in e-mobility. With the changeover at the Zwickau vehicle plant, Volkswagen is starting a far-reaching transformation of its global production network. In China too, two MEB plants are currently being created, at Anting/Shanghai and Foshan; they are due to start production only a few months after the Zwickau pilot plant in 2020. Volkswagen will also manufacture MEB vehicles in North America; the precise location is to be decided in the future. Further MEB plants are to follow. In addition to Zwickau, Volkswagen will convert two German factories to build electric cars – Emden and Hanover. With the so-called Roadmap E, the Volkswagen Group is driving forward its ambitious electric offensive. By 2025, 50 purely electric vehicles will be on the market worldwide, with one in four new vehicles to be powered by electricity only. China, the leading e-vehicle market, plays a central role for Roadmap E. In June, the opening of a second FAW-Volkswagen plant in Foshan marked another significant milestone for the electrification strategy in China. Owing to the plant expansion, annual production capacity in Foshan has doubled from 300,000 to 600,000 vehicles. 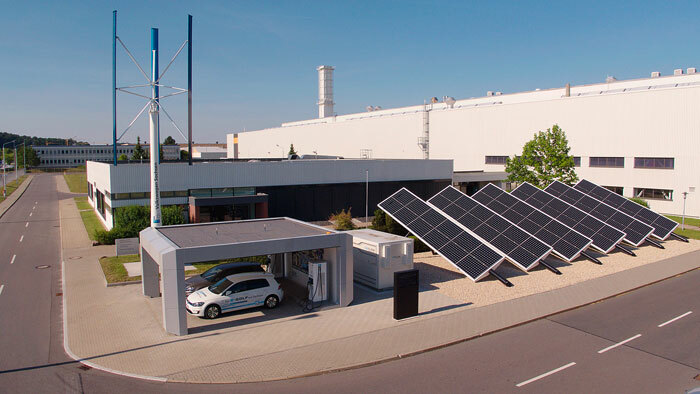 In addition to new SUV models from Volkswagen and Audi, the vehicles currently manufactured on the MQB platform are gradually being electrified. Moreover: by 2020, production of MEB vehicles, as well as MEB battery systems, is set to commence here.